The National Thoroughbred Racing Association announced Wednesday that Justify‘s dominant victory in the 150th Belmont Stakes to become just the 13th Triple Crown winner has been voted the 2018 NTRA Moment of the Year based on the results of 2,260 votes cast via Twitter and an online poll. The winning moment occurred on June 9, 2018. 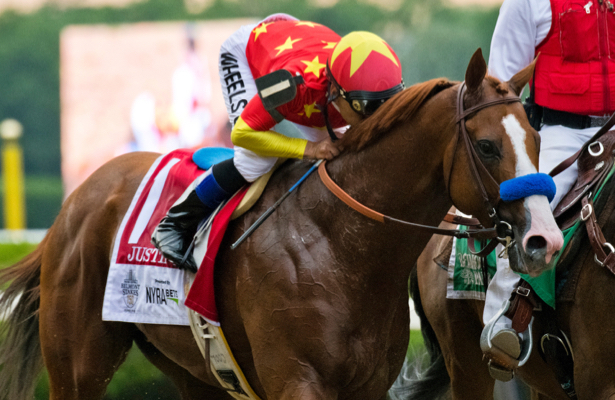 With Hall of Fame jockey Mike Smith in the irons, Justify led every point of call in the 1 1/2-mile race to prevail by 1 3/4 lengths and cap off his incredible ascent into the history books. Along the way, the Bob Baffert-trained colt also overcame the “Curse of Apollo” by becoming only the second horse to win the Kentucky Derby after not racing as a 2-year-old (Apollo was the first in 1882). Two weeks later, he then emerged from the dense fog in a surreal Preakness Stakes victory. The connections of Justify will be honored at Thursday evening’s 48th AnnualEclipse Awards Presented by Daily Racing Form, Breeders’ Cup and The Stronach Group at Gulfstream Park Racing and Casino in Hallandale Beach, Fla. The Eclipse Awards will air live on TVG at 8 p.m. ET. TVG is available in more than 45 million homes nationwide. The ceremony also will be available via DirecTV Now, Apple TV, Amazon Fire TV, and Roku. NTRA Moment of the Year voters chose from 12 occurrences illustrating a range of human emotions as well as outstanding displays of equine athleticism. Finishing second was Diversify’s victory in the Whitney Stakes last August, his final win before the passing of trainer Rick Violette, Jr. In 2010, fans selected Blame’s narrow Breeders’ Cup Classic victory over Zenyatta. Drosselmeyer’s hard-fought win over Game on Dude in the Breeders’ Cup Classic was the public’s choice for 2011. For 2012, the recovery of Paynter from near-deadly battles with laminitis and colitis captured the hearts of voters like no other story. In 2013, fans recognized Mucho Macho Man’s nose victory in the $5 million Breeders’ Cup Classic for his popular connections. The 2014 award went to California Chrome’s dominant win in Kentucky Derby 140. In 2015 there was a landslide vote in favor of American Pharoah’s historic Triple Crown-clinching Belmont Stakes win. California Chrome was again part of the winning moment in 2016 – a dramatic Dubai World Cup victory that came as Victor Espinoza’s saddle slipped out from underneath him. The 2017 season saw fans vote for the tragedy of the Lilac Fire that devastated the San Luis Rey Training Center in Bonsall, Calif., near San Diego.